High accuracy ±3%RH & ±0.4°C. Stores up to 2048 sets of readings. Globally unique 64-Bit serial number. 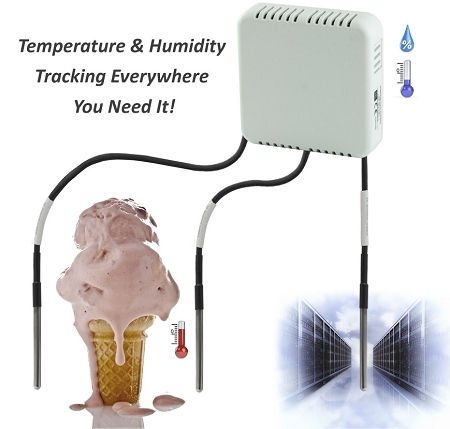 Connect up to 3 external temperature probes. Greater transmission range by 10x. Energy efficient low power design. Universally accepted 2.4Ghz radio frequency. Mesh Network provides multiple transmission paths. Meets FCC, Industry Canada and CE Marking Standards. 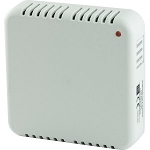 The MeshNet Wireless Temperature / Humidity Sensor Generation 2 with External Probe Support, MN-ENV-H-THX, offers superior environmental monitoring reliability & performance in an easily deployed system. 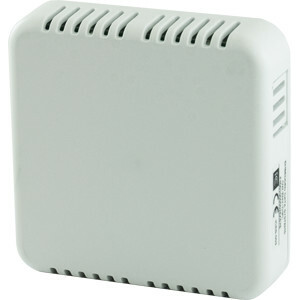 Like other MN-ENV sensors, this sensor has a discrete input, and its wireless transmissions utilize the 2.4GHz frequency range allowing for global usage. 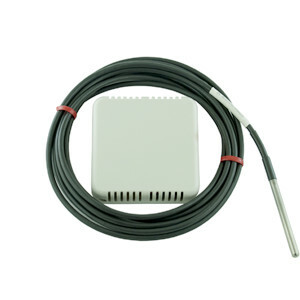 However unlike other MN-ENV sensors, this sensor enables you to connect up to 3 waterproof stainless steel temperature probes designed for installation in freezers, refrigerators, and wet environments. Additionally, the MN-ENV-H-THX features a more powerful radio which increases its transmission range by an order of magnitude (10x). Our Generation 2 MeshNet sensor line’s multi-pronged approach allows you to achieve greater reliability. 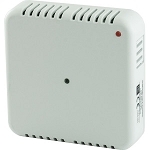 It prevents data gaps and enables the Generation 2 MeshNet sensor to provide a complete log of your temperature and humidity data in spite of data interruptions such as; power outages, network failures, or other obstructions. Sensors send and receive data packets - Each sensor (node) has the capability to both transmit and receive data packets. The ability to receive confirmations enables the sensor to alter its behavior to address a failed transmission. Sensors buffer data - If a failed transmission occurs, the sensor immediately begins buffering critical sensor data within its internal memory. The buffer's capacity is sufficient to log the internal temperature and humidity sensor data, along with the 3 optional external temperature probes, and the discrete input; for up to 10.6 days at a 15 minute logging rate. Sensors scan and hop frequencies - If a failed transmission occurs, sensors then search available channels for the MeshNet Controller. The MeshNet Controller will hop frequencies which allows the system to navigate to quieter bands as the radio environment changes. Sensors report transmission strength - All MeshNet devices report the strength of the transmissions they receive, allowing areas that may be susceptible to interference to be identified and addressed proactively (e.g. adding repeaters). Connect the MeshNet Controller to the network and power. Checking the DHCP Server for the assigned IP Address. From the MeshNet Controller's home page select "System Configuration>Devices" from the menu bar. The device page enables you to link and unlink sensors from the MeshNet Controller. You will be prompted for login credentials. The defaults are User Name "admin" and Password "eds". Insert batteries into the sensor. The sensor will appear in the "Unlinked Devices" section. Select the sensor when it appears and then click "OK" on the popup prompt. The sensor will be linked (and moved to the "Linked Devices" section) on its next transmission. The battery voltage varies depending on how much current is flowing. When the sensor is sleeping, the voltage is higher than when it is awake. The reading is taken when the sensor is awake. Recommended humidity operating range is 20% to 80% RH (non-condensing) over –10 °C to 60 °C. Prolonged operation beyond these ranges may result in a shift of sensor reading, with slow recovery time. Discrete input voltages are ratiometric, based on the battery voltage. The input low voltage maximum equation is 0.15 * Vbat, the input high voltage minimum equation is 0.25 * Vbat + 0.8. Excludes hysteresis, long term drift, and certain other factors and is applicable to non- condensing environments only. Drift due to aging effects at typical room conditions of 30 °C and 30% to 50% RH. May be impacted by dust, vaporized solvents or other contaminants, e.g., out-gassing tapes, adhesives, packaging materials, etc. Response time to a step change in RH. Time for the RH output to change by 63% of the total RH change. The sensors are designed to monitor a dry contact. R11 must be removed if power is on the discrete input.